It’s winter in Wisconsin and the chicken coop isn’t heated. In fact, the chicken coop lacks an electrical connection as well, so except for taking pots of heated water in on the coldest days, trying to heat the coop must come from other sources. The slant of the roof and placement of the window ensure that the coop receives maximum winter heat. The tree that normally shields the coop from the sun during the summer months is bare, letting the sun come through. Even with all these measures, the coop is cold enough to let the chicken’s water freeze. My goals for various activities on my small farm include doing things in a manner that makes my carbon footprint small and keeps costs low. Consequently, I always look for solutions that don’t involve much in the way of high technology, such as obtaining heated chicken waterers. I did seriously look at a solar powered unit for a while, but decided that the chickens would probably destroy it in short order. The better solution turned out to be adding vinegar to the chicken water. It turns out that vinegar has both a lower freezing temperature and higher boiling point than water. The freezing temperature of vinegar is 28 degrees, but that level increases when you add more water. I tried various levels of vinegar in the chicken water and found that ½ cup per gallon seems to keep the water from freezing for about an hour longer when the outside temperature is in the 15 to 30 degree range. Above 30 degrees, it kept the water from freezing at all. Adding vinegar to the water also keeps anything from growing inside the waterer, which means that the water is better for the chickens longer. This feature of adding vinegar is especially important during the summer, when all kinds of green gunk grows inside the waterer and is quite hard to keep out. If you look on other websites, you find that other people attribute all sorts of other benefits to using vinegar. Other websites warn against using vinegar. I haven’t personally tested any of these claims, so I’m not here to tell you that the chickens derive any benefit whatsoever from the vinegar in the water. However, I did try a simple experiment this past summer and found that given two buckets, precisely the same size, color, and make, one with vinegar and one without, the chickens always drank the vinegar water first. My feeling is that they seem to like it. So even if the chickens don’t gain any solid benefits from the vinegar, you can view it as a treat that helps keep the water from freezing longer and keeps their waterer cleaner. Let me know your thoughts on adding vinegar to the chicken water at John@JohnMuellerBooks.com. The fall brings a series of events that make for interesting visits to the coop looking for eggs. Because I have a mixed flock, there is a combination of pullets and hens out there. The hens haven’t been laying many eggs as of later because they’re molting. The pullet eggs are just now starting to get big enough to really count for something. I still get super jumbo eggs from my Buff Orpingtons. These eggs peg my scale and don’t actually fit well in the carton (even with jumbo cartons, I find I must exercise care in even trying to close it). The Buff Orpingons are the only birds who lay these rather huge eggs. 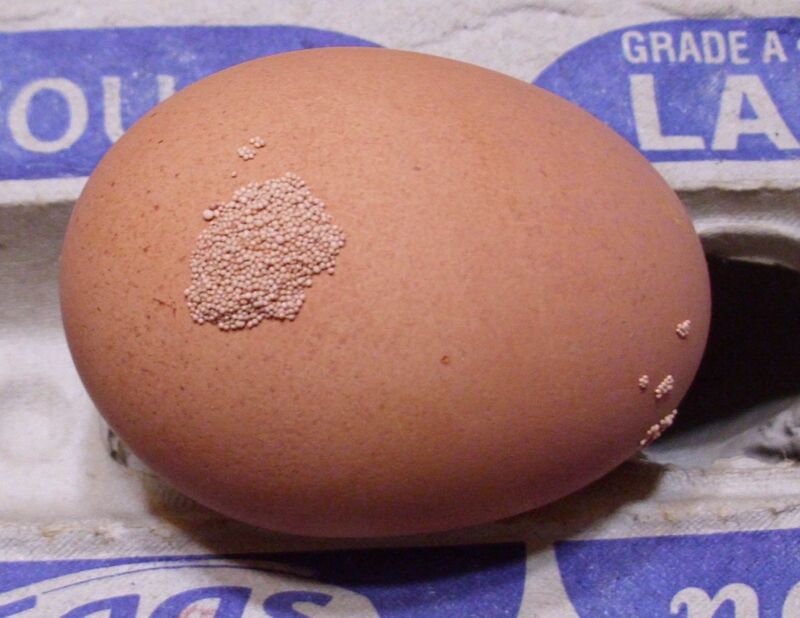 The Americauna eggs can get quite large too. The advantage of the Americaunas is that they produce more eggs and eat a bit less than the Buff Orpingtons. Plus, they have these really pretty blue eggs. At this point, I’m getting eggs in every possible size. You can see the difference in sizes from small on the right to super jumbo on the left. The eggs are always measured by weight. In addition, I check my eggs individually, so a carton that is listed as having large eggs has all large eggs in it (when you buy eggs in the store, the eggs are measured by overall carton weight, which means that you might have a mix of medium, large, and extra-large eggs in a single carton). 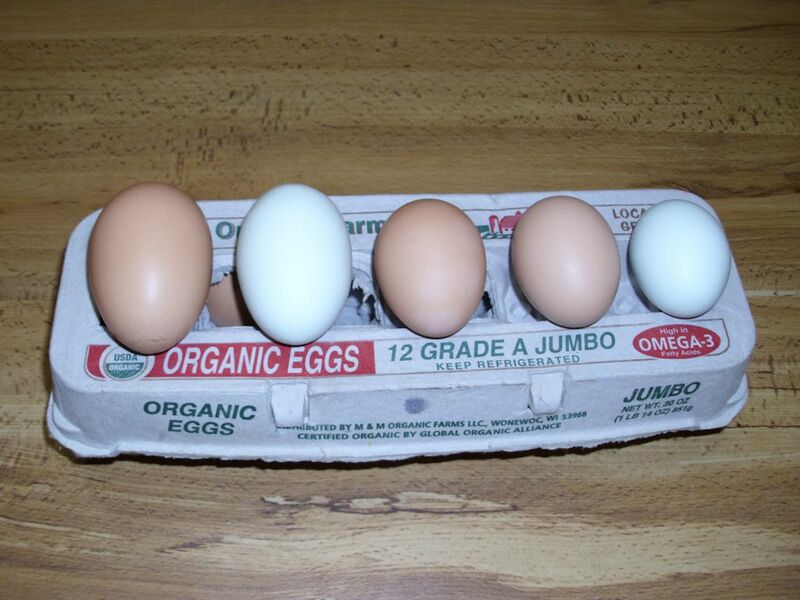 Even though the medium egg (second from right) looks similar in size to the large egg (directly in the middle), they weigh differently. It’s not always easy to tell just by looking at an egg how much egg you’re actually getting. 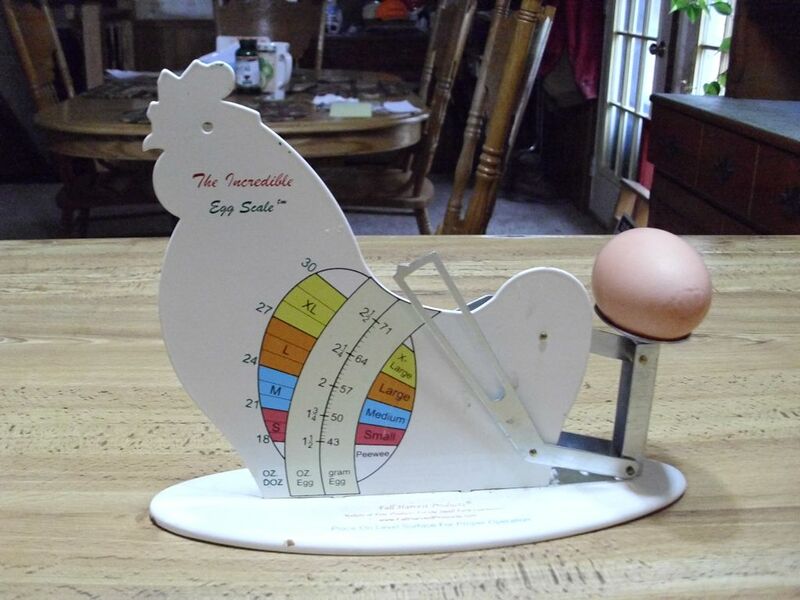 Of course, the size of your egg can affect the outcome of a recipe (which is why I’ve gone to weighing my eggs as described in Pullet Eggs and Cookies. Let me know about your experiences with various egg sizes at John@JohnMuellerBooks.com. Just one pullet is laying these eggs and she seems to want the world to know it. Right now they weigh in at a small egg size. I keep hoping that she’ll continue to lay these incredibly unusual eggs from now on, but something tells me that she probably won’t and that I need to enjoy them while I can. Given a chance, laying hens can prove to be quite entertaining and add interest to anyone’s life. Artistic eggs are just one of many ways in which my hens do their best to make my life happy. What sorts of unusual hen behavior have you seen? Let me know at John@JohnMuellerBooks.com. The chicks have become pullets and are laying what I would term as pullet bullets—smallish eggs that are sort of bullet shaped. 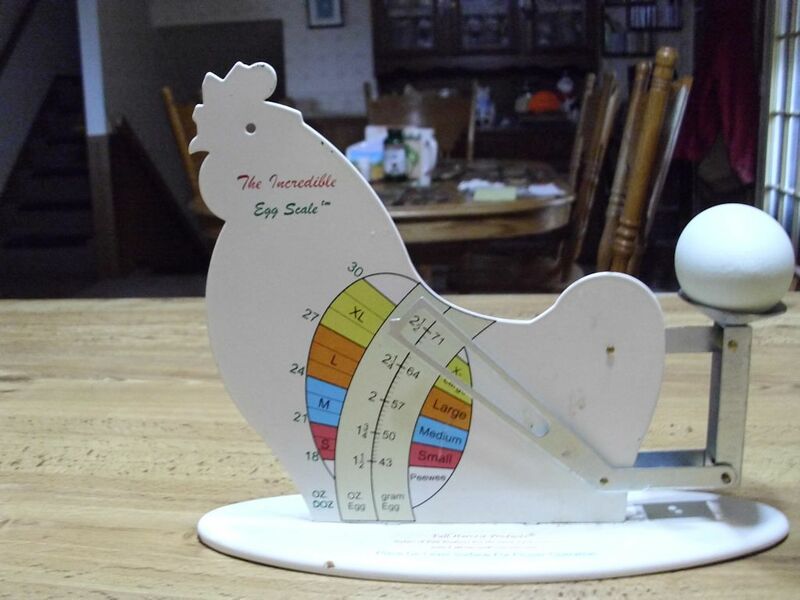 I’m talked about pullet eggs before in the Pullet Eggs post. They’re quite tasty as a snack or even as a breakfast, but you don’t want to use them for baking unless you find it acceptable to weigh the eggs carefully. I recently started experimenting a bit with pullet eggs because they’ll be a part of my life as long as I have laying hens. A large egg usually weighs between 2 and 2¼ ounces. Pullet eggs sometimes don’t even register on my scale, making them smaller than the 1 ounce peewee eggs. By using a really accurate scale, however, you can gather enough pullet eggs to work for baking purposes. For example, one of my cookie recipes calls for 5 (nominally large) eggs. What it really means is that you need between 10 ounces and 11¼ ounces of egg. In this case, that actually added up to eight pullet eggs (a total of 11 ounces). Because of the extra shell involved, you want to err on the high side of the needed weight. Initially I was concerned that the yolk to white ratio wouldn’t hold up when working with pullet eggs. After weighing the yolks and whites for several recipes separately, I’ve found that pullet eggs provide slightly higher amounts of yolk, which may make a difference for really sensitive recipes, but hasn’t affected any of the cookies I’ve tried so far. To date, I’ve tried pullet eggs in chocolate chip, oatmeal, and peanut butter cookies, and haven’t noticed any difference. 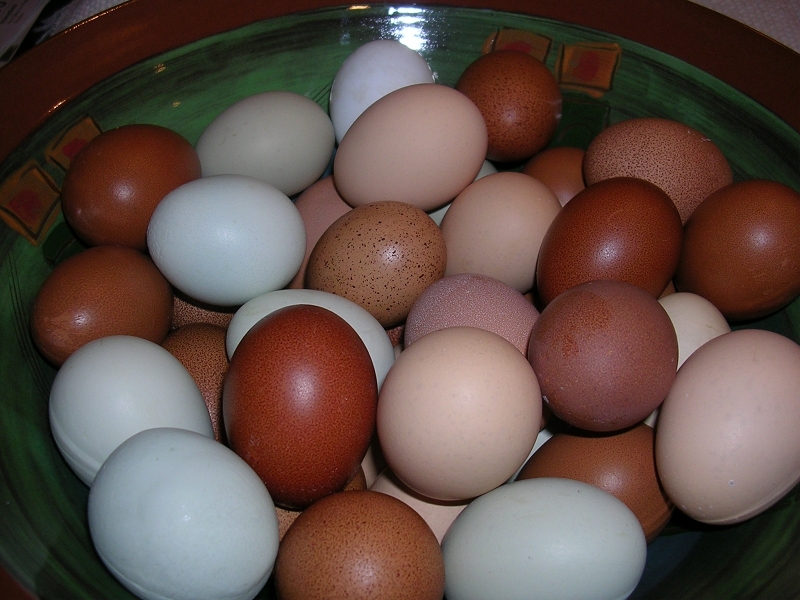 However, I’d love to hear from anyone else who has used pullet eggs for baking at John@JohnMuellerBooks.com. As the chicks, now pullets, lay more eggs, the eggs slowly become larger. That’s why it’s important to keep weighing the eggs out if you need a precise amount for a recipe. Always keep the larger amount of egg shell in mind as you perform your calculations and the fact that you get slightly more yolk. The difference is really quite small (it varies) and I don’t know that it actually matters, but it could. For me, the real test will come when I make homemade tapioca pudding, which uses the whites and yolks separately. The older hens are laying few eggs right now. In fact, three of them look downright horrid because they’re moulting. I’ve noticed that the hens require more time to recover from moulting as they grow older. They most definitely don’t lay eggs during this time. One of my older hens has taken upon herself to sit atop the pullet eggs, so she also isn’t laying eggs right now. Some hens, such as my Buff Orpingtons, are especially prone to being broody. The shorter days are also taking a toll on the egg production of the two remaining older hens that are laying. In short, most of the eggs I’m getting now are from the pullets, which is why I’m inclined to experiment a bit to find the best ways in which to use them. Now that the pullets are mostly full sized, there is peace once again in the coop. My 13 hens and pullets will spend their first winter together soon. On warmer days they’ll go out in the run, but colder days mean a lot more time in the coop, so I’m pleased to see everyone getting along better. The chicks are fast becoming pullets. No, they won’t become hens for quite a while yet. People get the idea that chicks become hens immediately, but they go through a pullet stage first. A pullet is a chick that lays smallish eggs and hasn’t moulted for the first time yet. A chick becomes a pullet at between 16 and 24 weeks of age. My chicks are currently 17 weeks old, but they’re of a “heavy” variety, which means that they get larger than most hens do and require more time to grow to size. It will likely be closer to the 24 week end of things before I see the first pullet eggs from them. However, the first signs that they will soon become pullets are all there. For example, their feathers and wings are now strong enough so they can fly to the top of the run fence and walk along it with relative ease. I saw a couple of them outside the run the other day—calling to their buddies who are still on the inside. Most important of all, they can get back into the run when trouble arrives. It won’t be long and they’ll be walking around outside the run on a regular basis, becoming free range birds. These fledged birds now have the ability to defend themselves a little, run from trouble to some extent, and get into all sorts of trouble. Another sign that they’re becoming pullets is that their combs and wattles are becoming fuller. They’re also making hen-like sounds now. They still don’t quite talk the talk, but they soon will. The beeping phase that happens between being a chick and being a pullet is coming to an end. The most important sign is that the pelvis bones are starting to separate. You can check the pelvis bones by holding the chick in your arms with it’s back facing toward you. Calm the bird and give it a good place for its feet so it doesn’t kick. Place your hand on its rear and you’ll feel three prominent bones. These bones will separate when the bird is ready to starting laying eggs. Pullets like to lay their first eggs in privacy, so expect to see the first eggs late in the day or even when you open the coop first thing in the morning. 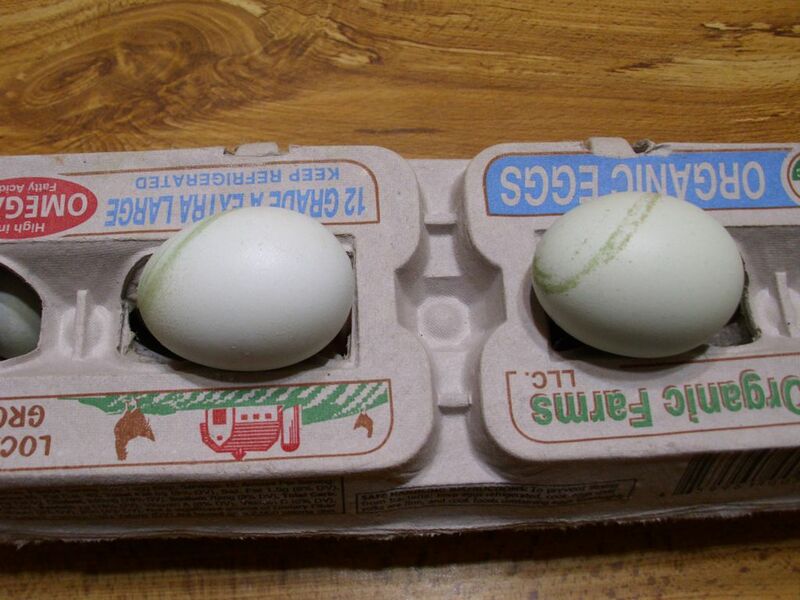 It’s important to check for eggs more often when your pullets start laying to keep egg eating at bay. Once the pullets begin to lay, I’ll go out every two hours during the day to check the nest box. A pullet can also be quite fussy about her surroundings, so make sure you change the hay in the nest box relatively often. Let me know your thoughts about pullets at John@JohnMuellerBooks.com. Now that the summer weather is truly come to stay, I’ve turned my attention more fully to keeping my animals cool. I’ve talked about this issue before as part of my Keeping Your Animals Healthy in Hot Weather post. However, over the years I’ve learned a few more tricks of the trade. The first is to keep the house at the same temperature as the outside as long as practical and rely on ceiling fans as much as possible. The approach saves money, of course, and makes my house more environmentally friendly as well, but it also seems to spare my animals some level of shock. This is especially the case with my dogs, who must go outside at various times during the day. I was actually finding that my dogs weren’t doing as well as they could when they got back in from outside and I think it was due to the shock of temperature change they felt. Of course, I also run my business out of the house, which means computers generating lots of heat and not liking to be overly hot. All of my computers have temperature sensors that monitor motherboard and chip temperatures as needed. I actually found that most systems today can run in higher temperatures as long as you keep the air circulated in the room. So, I now keep my house between 75 and 80 on hot days and rely on ceiling fans to keep the air circulating in my office. Because the office is where I’m generating the most heat, I monitor the temperature there, rather than the dining room (which contains the air conditioner thermostat). An office temperature of 80 can actually equate to a house temperature of about 75, which is quite comfortable. I adjust the thermostat as needed to keep the office at 80, rather than trying to keep the rest of the house at a specific temperature. Everyone gets shade during the summer months. However, I’ve been smart in the way I’ve provided shade. The shade is at the back of the cages and coop. The shade elements (mostly trees), hang slightly over the cages, coop, and run area. The front of the cages and coop are left as open as is possible so any breeze whatsoever can help keep the animals cool. Even so, I must still bring some of the rabbits in during really hot days and the chickens get their bucket of cooling water (they wade in it). It’s absolutely essential that the animals all have clean, cool water to drink, which means going out to change the water several times each day. I usually go out three times daily to check on everyone and make sure they’re doing well. The cats are always the easiest to please. Smucker still loves to sleep in the bathtub on hot summer days. Sugar Plum likes the floor in the other bathroom. I tend to leave them alone except for the checks I make on them. Animals still need hugs during the summer months and they still need play time. I’ve been getting out at 5:00 to ensure that I take care of these needs when it’s still cool. During the day I leave the animals completely alone and do everything I can to help them rest comfortably. Making sure you keep track of your animals and address their needs is one certain way to keep them around longer and to enjoy your time with them more. Let me know your thoughts about keeping animals cool at John@JohnMuellerBooks.com.